Eek - maybe this is worth a rethink? 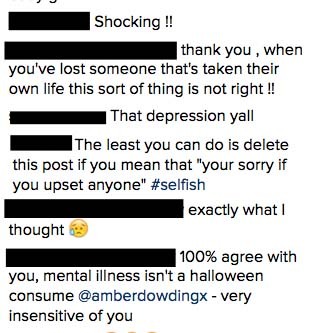 The reality star and hairdresser has been encouraged to apologise after posting a very gory-looking picture of herself dressed up for Halloween, showing her wrists and neck ‘slit open’ – yikes. As imagined, it’s not a pretty sight – but some fans have deemed the look ‘insensitive’ due to the fact it looks like she’s self-harmed. Gallery: Are these the most inappropriate Halloween costumes – EVER? Amber, 23, posted the shocking picture to her Instagram page to show her fans a close-up view of her look, teasing that the full outfit picture is yet to come. Well, Halloween costumes are meant to be disturbing! Though the look is pretty impressive due to its incredibly realistic look, the picture has been the source for some followers, who think it’s making light of some serious mental health issues. ‘I am sorry if I have upset anyone. As you will see in my next picture I am a prisoner and they are cuts from the handcuffs,’ she wrote on the picture from Wednesday (26th October).